This ground-breaking exhibition looks at some of the boldest contemporary image-makers on the Northwest Coast. ŚXEL,ES - New Painting (ŚXEL,ES, in the Coast Salish Indigenous language of SENĆOŦEN, means ‘any image or graphic such as markings, drawing, paintings, etc.’) brings together a collection of Coast Salish and Northwest Coast artists who are pushing the boundary of expected themes and characters with bold and emphatic works. These artists – informally part of the New School of Northwest Coast Painting – are bringing an excitingly different perspective to contemporary indigenous art. This hallmark group exhibition at Alcheringa Gallery showcases the vivid interpretation of traditional motifs through new ideas of abstraction, colour, political commentary, form line, and adaptation of symbols. The sense of painterly rhythm and movement creates an individual energy that is totally unique to the personality of the artist, while still referencing cultural traditions. 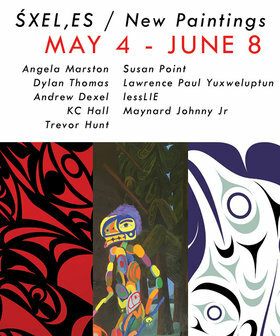 The exhibition will feature some of Canada’s top artists including a series of four rare and new Susan Point paintings, a Lawrence Paul Yuxweluptun painting (who is internationally renowned and rarely exhibited in Victoria), and a new lessLIE painting (whose work has been collected by the National Gallery of Canada). Going far beyond subject matter or theme alone, this exhibition hopes to attune ourselves to the individual artists’ approach, technique, conception, application and execution. Finally, these New School of Northwest Coast Painting artists continue to showcase the resurgence of Canadian contemporary indigenous art.